The Danube River originates in Germany and flows southeast 1,770 miles through ten countries and into the Black Sea. With the help of a lock system, 1,500 of those miles are navigable, thus it is an attractive river cruise destination. Tons of tour companies offer countless Danube River cruises on very long boats. The average length of a Danube River Cruise is around eight days and the cruises pass through multiple countries. My friend Kristin and I took a cruise upriver from Hungary to Germany with additional stops in Slovakia and Austria. When speaking of a Danube River Cruise, the Danube seems synonymous with Viking. Viking River Cruises is the most awarded river cruise. Having said that, through my vacation club, I stumbled across a Canadian Company called Emerald Waterways. Emerald Waterways has been voted the best value for the money for the last two years. Since this was my first river cruise, I can’t compare the companies, however, based on other trips which include a small Baltic Sea Cruise, an expedition to the Arctic as well as the Antarctic, a trans-Atlantic crossing, and a few sailing tours, I could see how Emerald Waterways won such an award. The boat: modern and well-kept. The staff: friendly. Guides: Outstanding. The food: tasty. Daily Programs: Informative. Entertainment: Needs Improvement. Overall, we enjoyed the experience and would take another trip with Emerald Waterways. We boarded the Emerald Sun in Budapest for our Danube River cruise. Our bags were carried to our room on the second floor. I loved the floor to ceiling windows which made the room feel more spacious. Of course, the storage was limited, but between the closet, a few drawers and our suitcases under our bed, we managed. The beds were comfortable and the turn down service included a chocolate on our pillows. The small bathroom included an easy to flush toilet, sink and shower with very hot water. Our room was located on the second level which was very convenient. Most of the time we boarded and deboarded from the lobby on this level. In addition, the dining room and TINY gym were located on the second floor. The third floor included the bar/lounge area and the pool room which turned into a movie theatre at night. The lower level had rooms and the kitchen. The top of the boat features a deck for walking, lounging and sight-seeing, though this area is mostly utilized in the summer. On our Danube River cruise, we took the majority of our meals in the dining room, though a light breakfast, high tea, and pre and post dinner drinks could be found in the lounge. Breakfast featured a large buffet with meats, cheeses, fruits, yoghurt, granola, salads, pastries and eggs to order along with tea, coffee and juices. Lunch was also a buffet with a variety of salads as well as some warms items usually including a local dish. There was enough food on the buffet to skip reading the menu, so it wasn’t until the second afternoon that we figured out we could order a regular meal. Dinner was always four courses…appetizer, soup, entrée, and dessert. The menu offered a few choices in each category, featured items, and worse case scenario a few staple options at the bottom for picky eaters. Beer and wine were included in the price of the voyage. The waitstaff was very good at keeping the wine flowing. Getting beer was pretty easy. Water, on the other hand, required an ask to get refilled! Most of the time we cruised at night and visited a different city every day. Generally, we joined an hour walking tour with a choice of six different guides, and then used our free time to wander around or relax. The tours weren’t mandatory, so sometimes people just did what they wanted. See the links at the bottom of this page for our cruise stops. 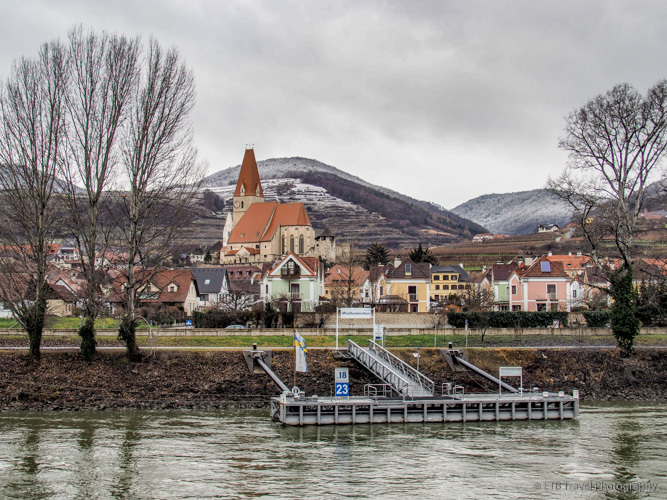 One day on our Danube River cruise, we stopped at two small places. This was one of the few times we cruised during daylight hours. The course led us through Wachau Valley, a UNSECO World Heritage Site, which was beautiful. As we passed by, the cruise director described the region, its wine, and it churches. During this time on the river, we also had the opportunity to see how the locks worked. We entered the locks and the gates closed behind us. Then we waited while the lock filled up with water. Since we were traveling up river, we needed to rise up to the next level of water. Traveling downriver, we would have had to wait for the water to drain. Once the water levels equaled, we got the green light to go. Some of the bridges were so low that anyone on the top deck had to duck as we passed under. In some cases, the captain’s bridge on the top deck had to be lowered and many times the top deck was completely closed to passengers. Emerald Waterways scheduled other entertainment while we were on the boat including local music demonstrations, a cooking demonstration, trivia, the regular evenings of live music, and movie nights. The most fun was the trivia. Emerald Waterways also offered some optional excursions available for an additional price. Most were in lieu of the regular choices on our Danube River cruise, but one was an evening concert in Vienna. Since we were on the final Danube River cruise of the season, we actually got to tour the tiny kitchen. It’s amazing six cooks and two dishwashers could even fit in there, much less cook for the entire boat! The kitchen included a hot area, cold area, pastry section, and dishwashing area. Due to being on a boat, they couldn’t cook with gas. Everything required great timing. The daylight hours were limited. I’m not sure if this affected our time in each place or not. Maybe not since they have to get to ports by certain times and coordinate docking next to other ships (that we sometimes walked across to get to our own). But the views along the river were limited with darkness falling at 4:30pm. Due to cold weather and dark hours, using the top deck wasn’t terribly appealing. This would have been a wonderful spot for relaxing in the summer months. Without much time for the deck, the amounts of public places to relax on the boat were limited to the lounge and the pool which felt a little confining. Want to Take this Article With You? Click HERE to download this offline GPS guided travel article with the GPSMyCity Travel App.